This birthday card is for two challenges. First, I used the Freshly Made Sketch#151 here. 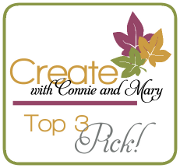 And second, the Create with Connie & Mary Challenge#318 here. This was a color challenge to use the colors Hello Honey, Pool Party and Basic Grey. Petite Pairs and Four Frames are the stamp sets with some Moonlight DSP Stack and some Flashback DSP. 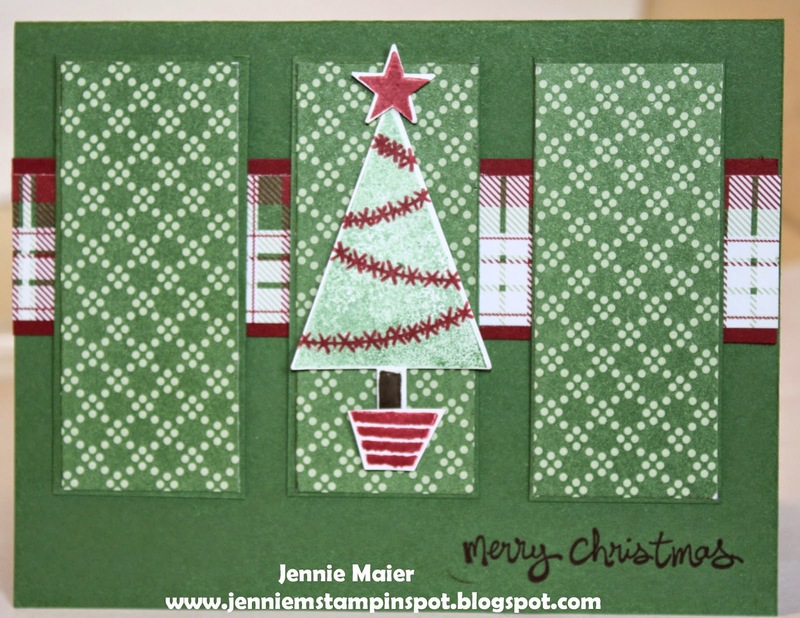 Here's another card using the Festival of Trees set. 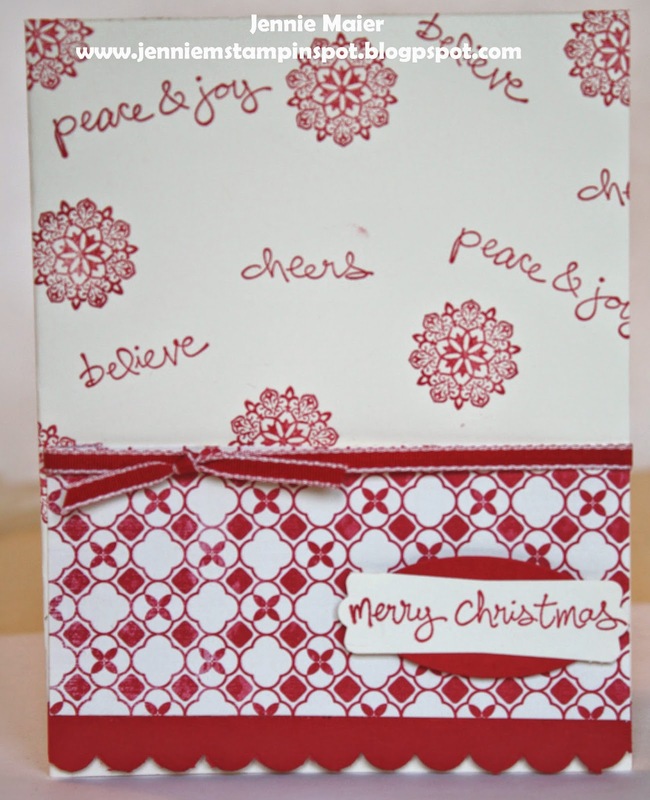 I'm getting a start on all my Christmas cards with this one and it also uses the Good Greetings stamp sets. And there's some Trim the Tree DSP Stack. 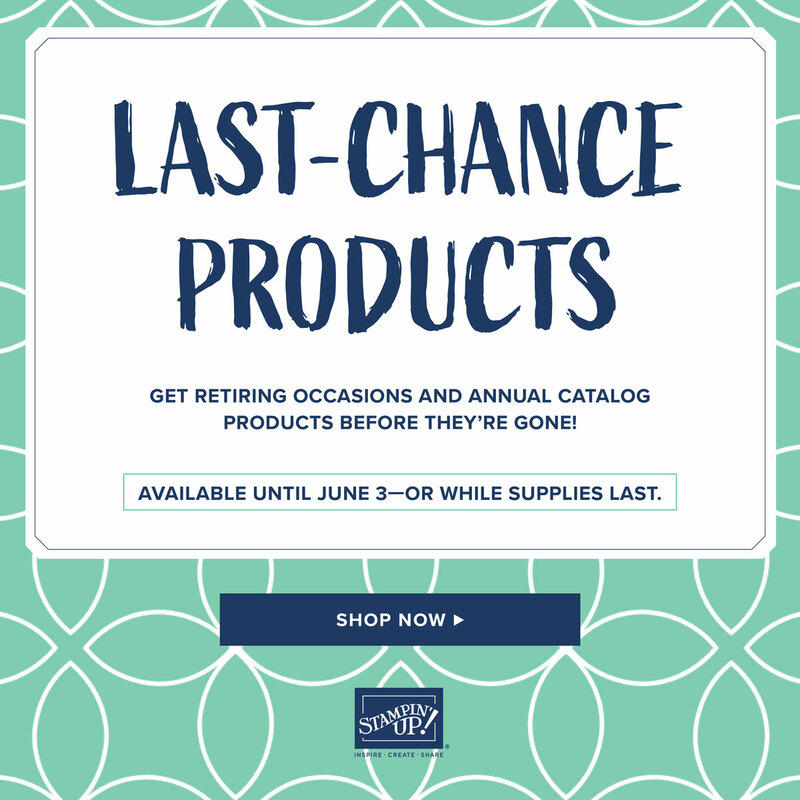 Today's the day the Holiday Catalog goodies are up for sale! 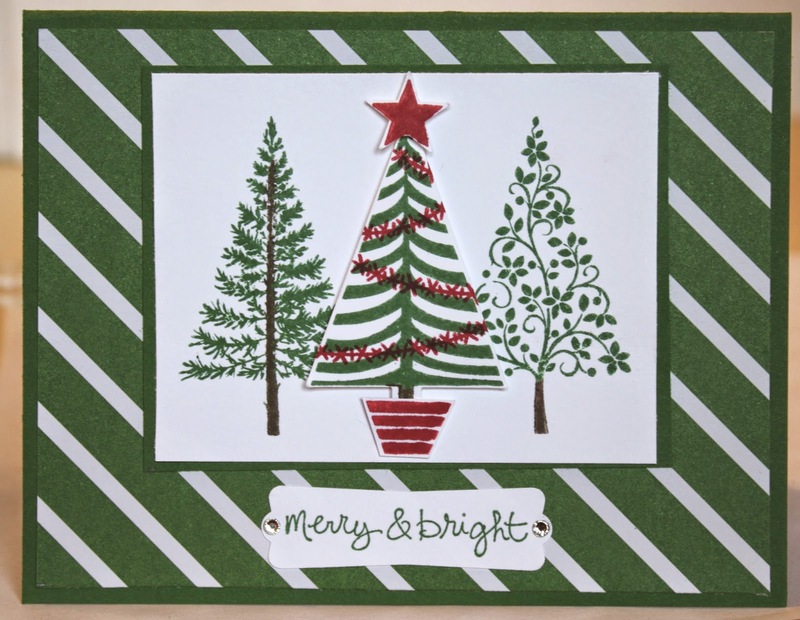 This card uses the new, Festival of Trees, coordinating Tree punch, Good Greetings stamp set and some Trim the Tree DSP Stack. I also used the Splitcoast Sketch#503 here. This birthday card is for two challenges. First, the MojoMonday Sketch#360 here. And second, the Splitcoast Color Challenge#493 here. The colors to use are Calypso Coral, Old Olive and Lost Lagoon. 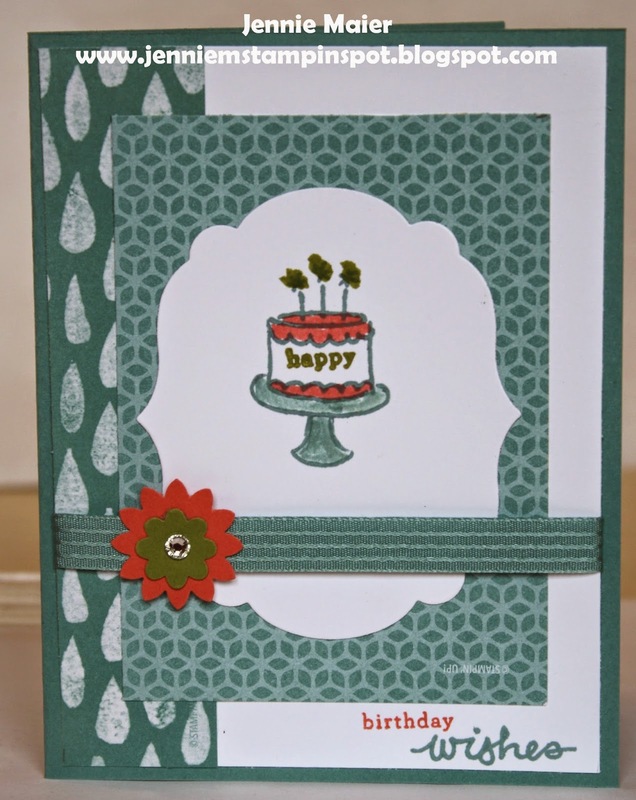 Endless Birthday Wishes is the stamp set with some Moonlight DSP Stack and Flowerpot DSP. More Holiday Catalog Sneak Peek Goodies! 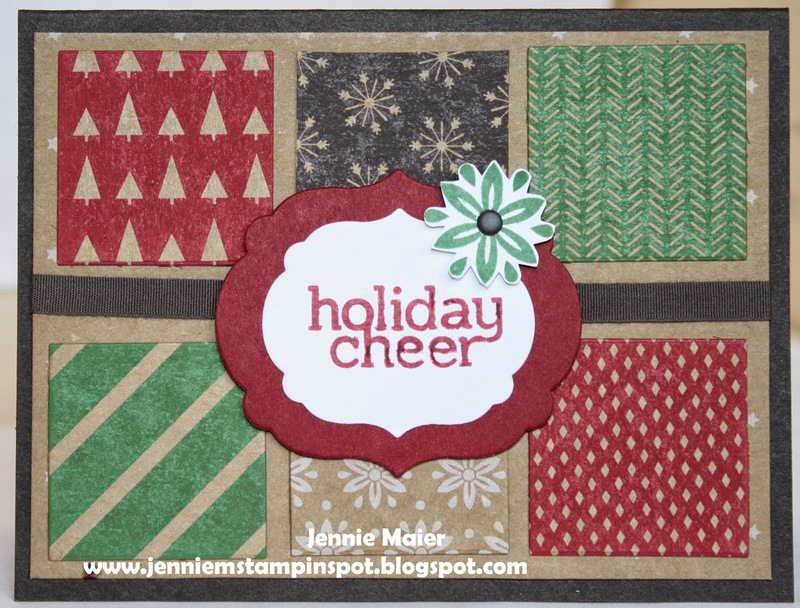 This Christmas card features new products in the Holiday Mini. Festival of Trees is the stamp set and then there's some Trim the Tree DSP Stack. And best yet, Festival of Trees has a coordinating Tree Punch! More birthday cards! This one is for the PPA#216 here. 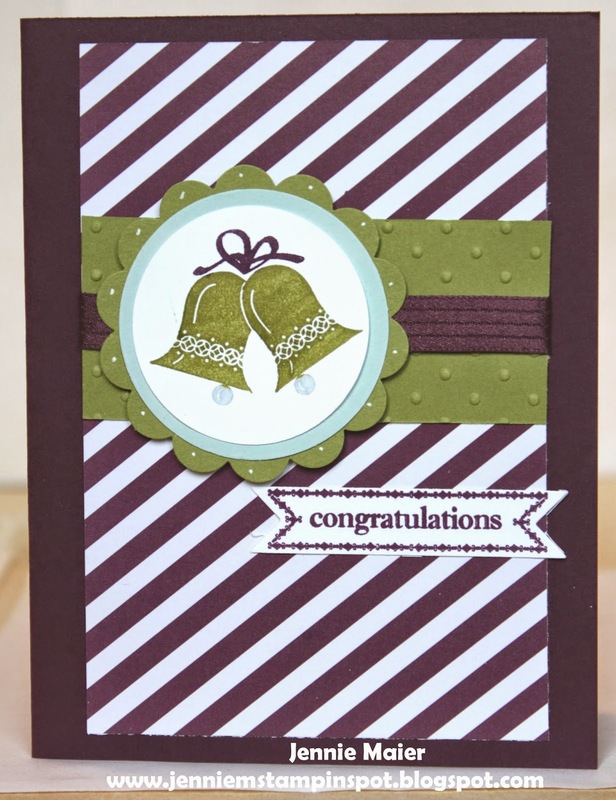 Perfect Pennants is the stamp set with some Confetti Celebration DSP. This birthday card uses the Splitcoast Sketch#502 here. 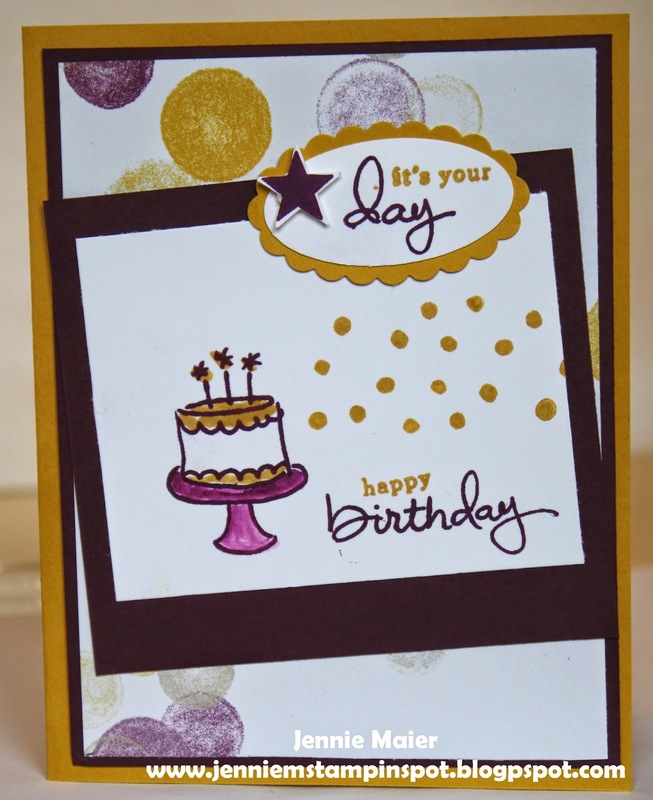 Endless Birthday Wishes and the star from Festival of Trees are the stamp sets with some Moonlight DSP Stack. 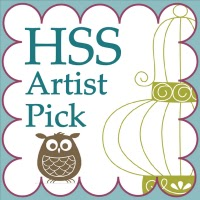 This card uses the Freshly Made Sketch#150 here. 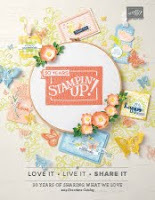 Mixed Bunch, Flower Shop and Embellished Events are the stamp sets with some Flowerpot DSP. 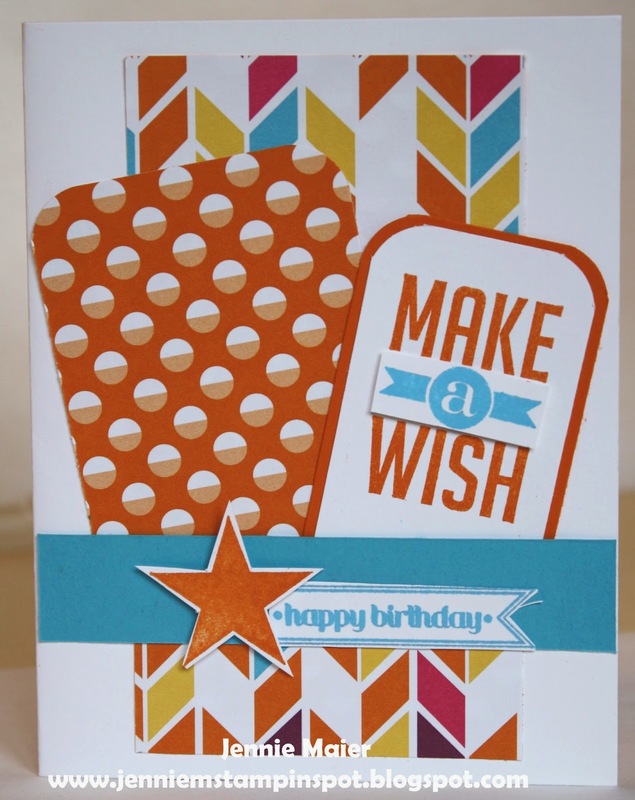 This birthday card uses the Splitcoast Color Challenge#492 here. The colors to use are Chocolate Chip, So Saffron and Pretty in Pink. I substituted Blushing Bride for the Pretty in Pink. 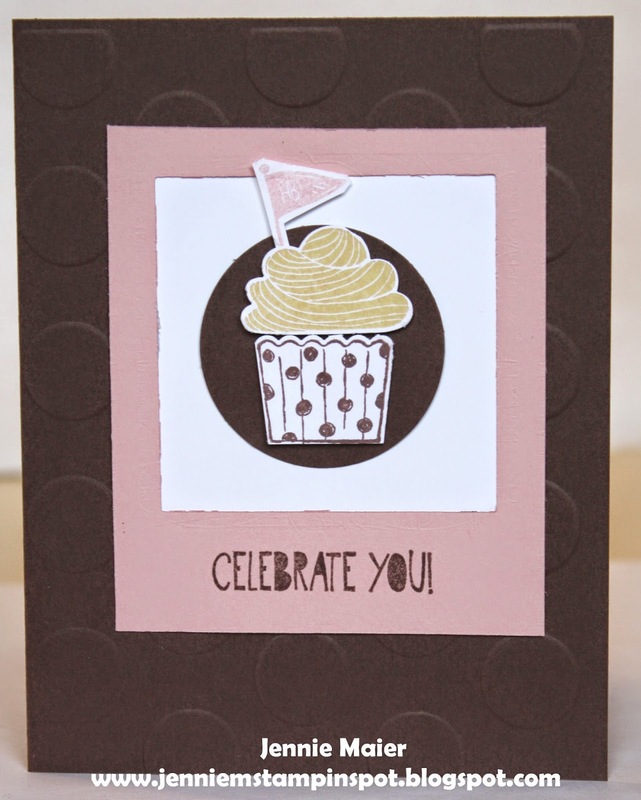 Cupcake Party is the stamp set. This wedding card uses the Create with Connie and Mary Challenge#316 here. It's to use the colors Blackberry Bliss, Soft Sky and Old Olive. I used the Embellished Events and Itty Bitty Banners stamp sets with some Moonlight DSP Stack. This birthday card is for two challenges. First, the Clean and Simple Stamping FTL#303 here. And second, the PPA Color Challenge #215 here. The colors to use are Strawberry Slush, Pear Pizzazz and Basic Black. 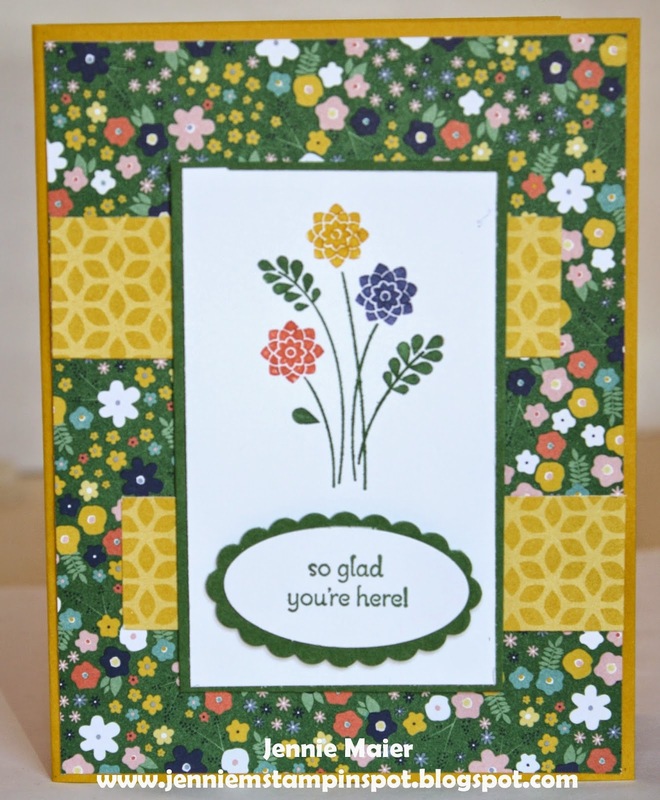 Flower Shop and Itty Bitty Banners are the stamp sets with some Back to Black DSP. Here's another welcome card. 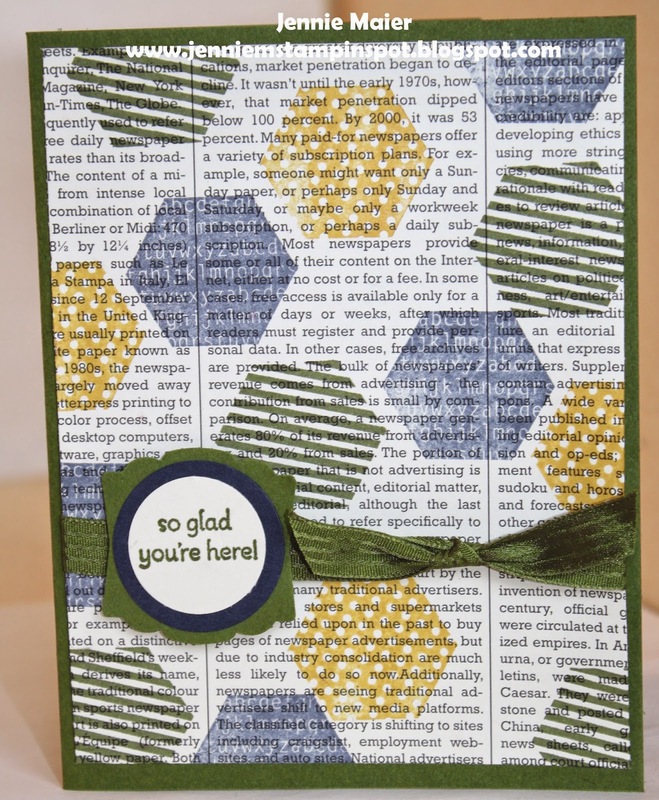 This one uses some Typeset Specialty DSP and the Six-Sided Sampler and Petite Pairs stamp sets. Yet another Holiday Catty preview. 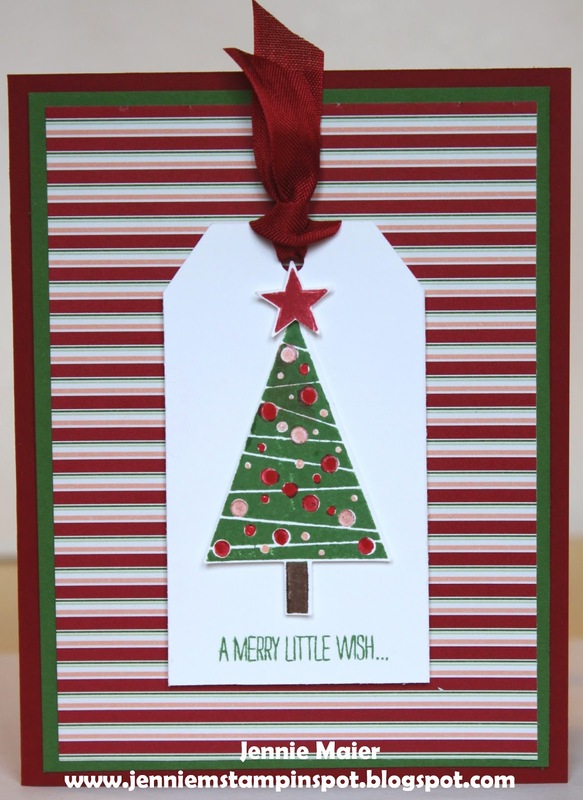 This one uses the stamp set, Cheerful Tags and the Under the Tree Specialty DSP. Love these patterns! For this simple card I used the Splitcoast Sketch#501 here. 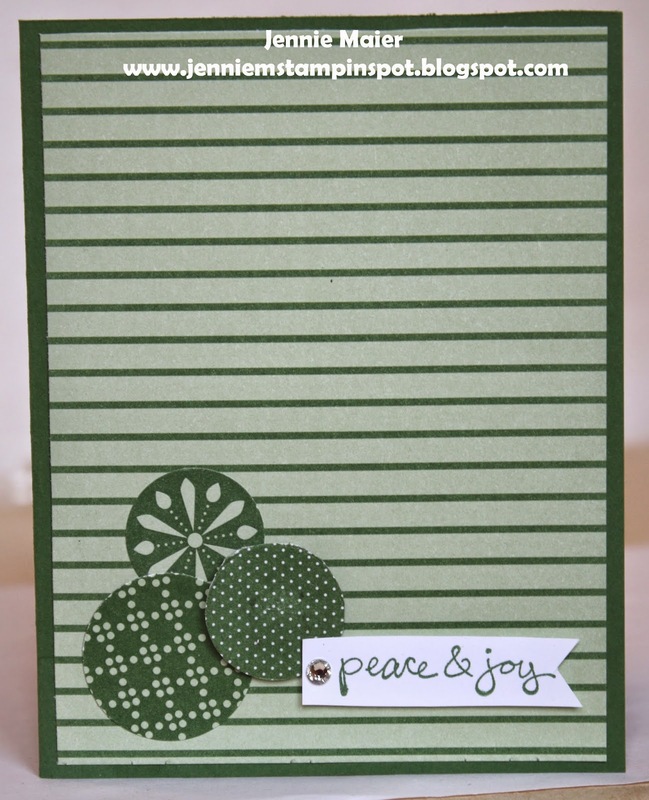 Good Greetings is the stamp set with some different patterns from the Trim the Tree DSP Stack. 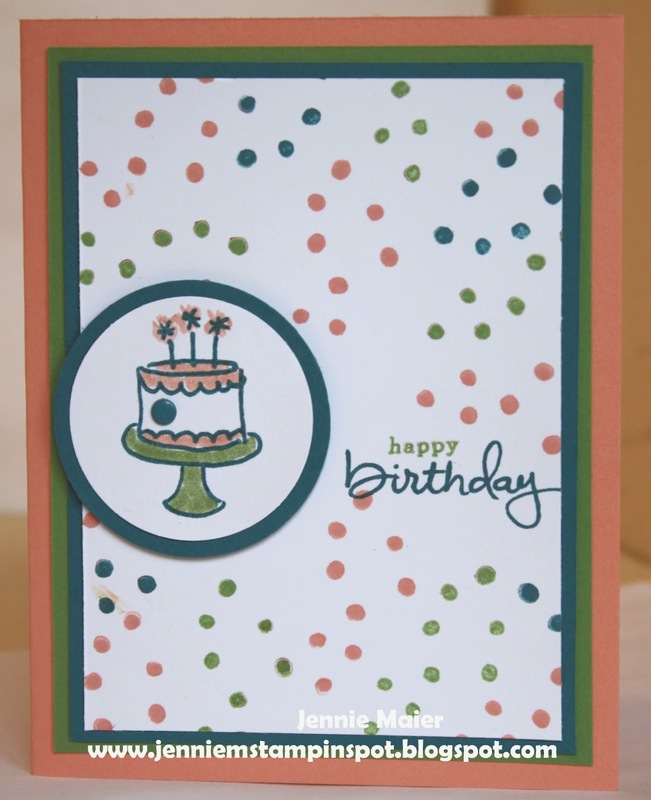 Here's a bright birthday card using the Splitcoast Color Challenge#491 here. The colors to use are Blackberry Bliss, So Saffron and Bermuda Bay. 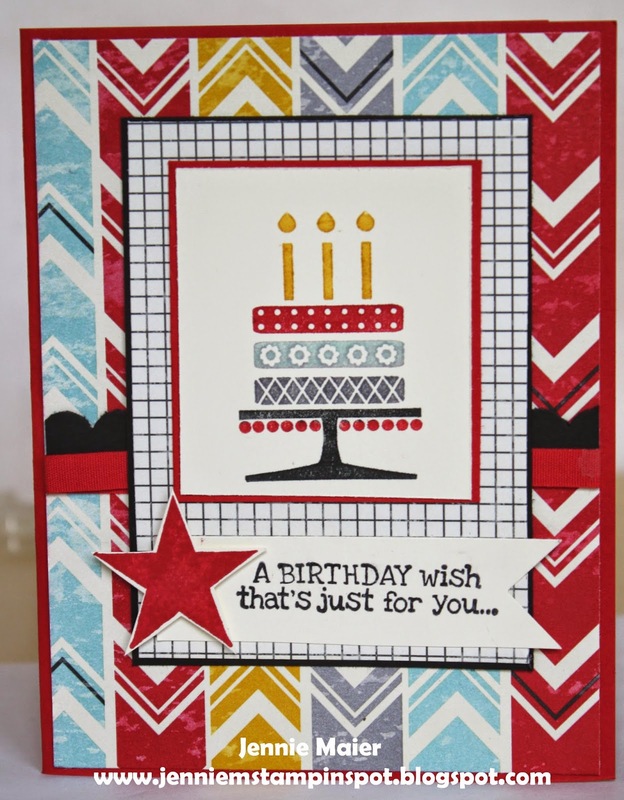 Endless Birthday Wishes is the stamp set with some Brights DSP Stack. I've been asked to create some cards for a home and school association so here's one of the welcome cards for new teachers. I used the Freshly Made Sketch# 149 here. 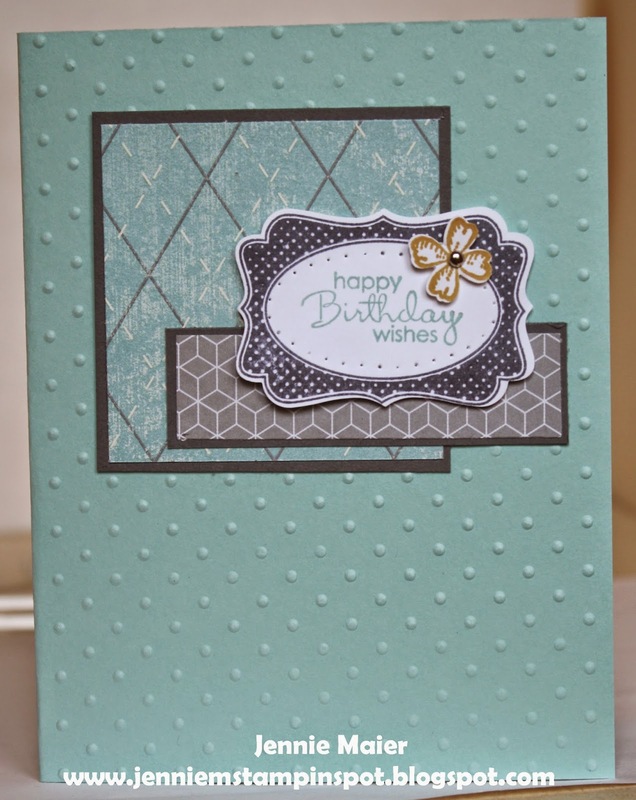 Embellished Events and Petite Pairs are the stamp sets with some Flowerpot DSP. This birthday card uses the MojoMonday#358 here. 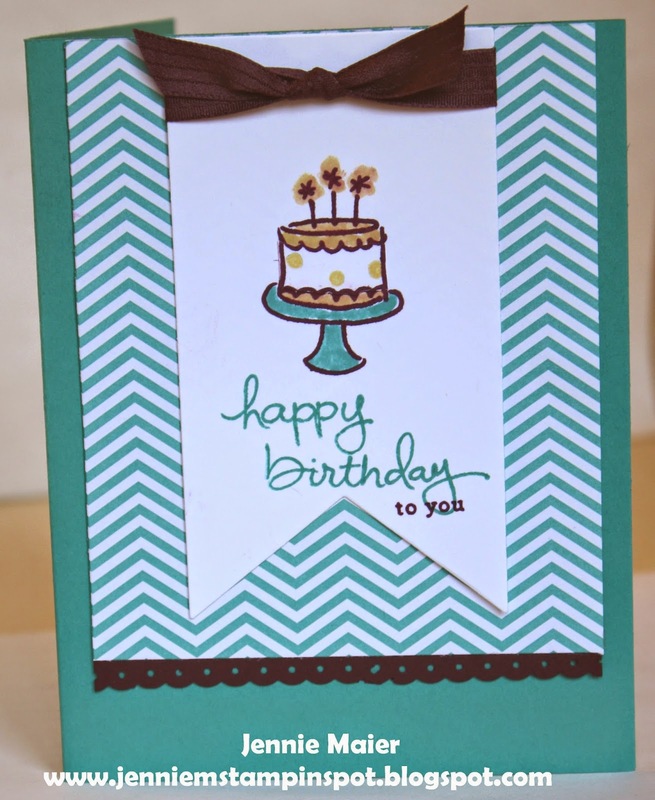 Embellished Events, Remembering Your Birthday and Perfect Pennants are the stamp sets with some Flashback DSP. This birthday card uses the PPA#214 here. It's a color challenge to use Island Indigo, Crisp Cantaloupe and Wild Wasabi. Endless Birthday Wishes is the stamp set. Here's another sneak peek from the Holiday Catalog. I used the Spitcoast Sketch#500 here. The stamp sets are Fall Fest and Good Greetings. 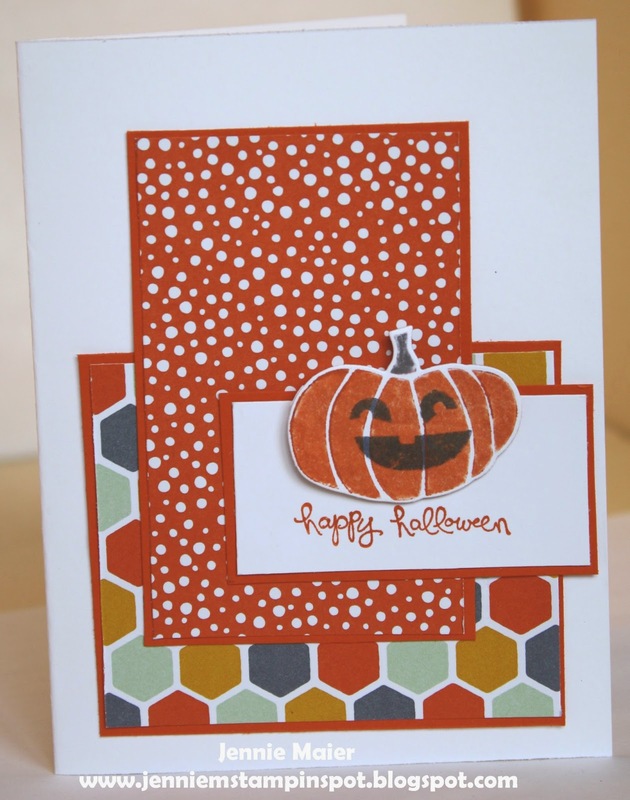 And Fall Fest has a coordinating framelit die, Fun Fall Framelits. There's also some Confetti Celebration DSP. My Holiday Catalog pre-order arrived so I had to play with my new goodies. I used the Freshly Made Sketch#148 here. 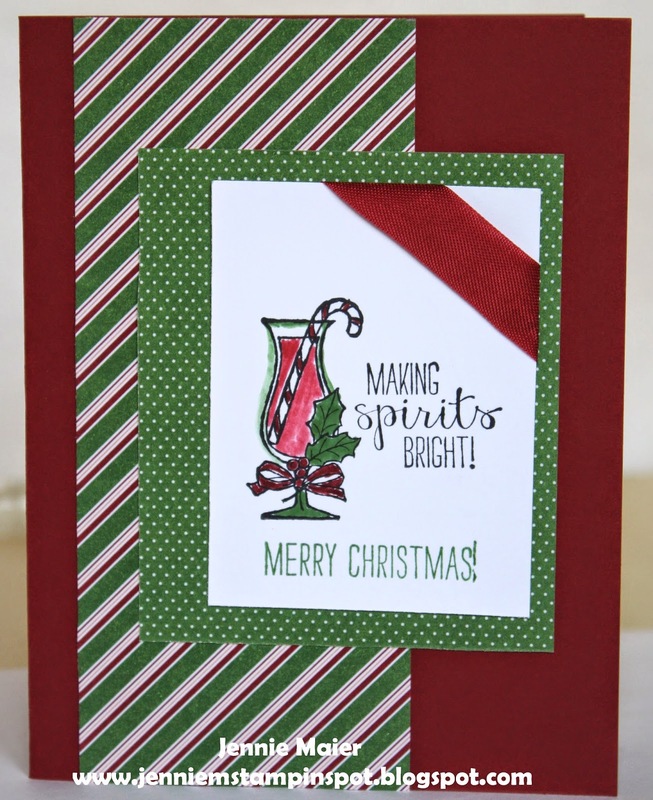 Making Spirits Bright is the new stamp set with the new Trim the Tree DSP Stack. Lots more Christmas cards to come since I send all hand-made cards! 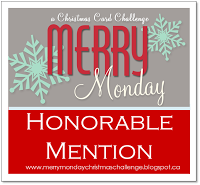 This card was made for two challenges. 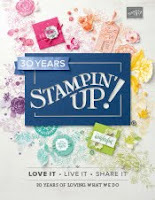 First, the Stampin' Celebration #84 here-back to school. And second, the Splitcoast Color Challenge#490 here. The colors to use are Cherry Cobbler, Daffodil Delight, Wild Wasabi and Pool Party. I used the Flower Shop and Great Greetings stamp sets. I thought the colors are very "elementary" and used the alphabet flower stamp. This would be a perfect teacher card! 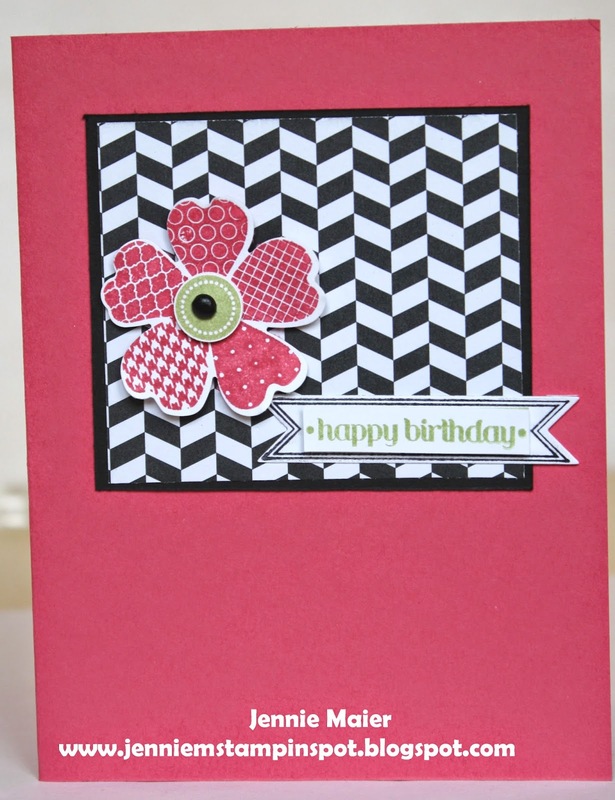 This bright birthday card uses the MojoMonday#357 here. 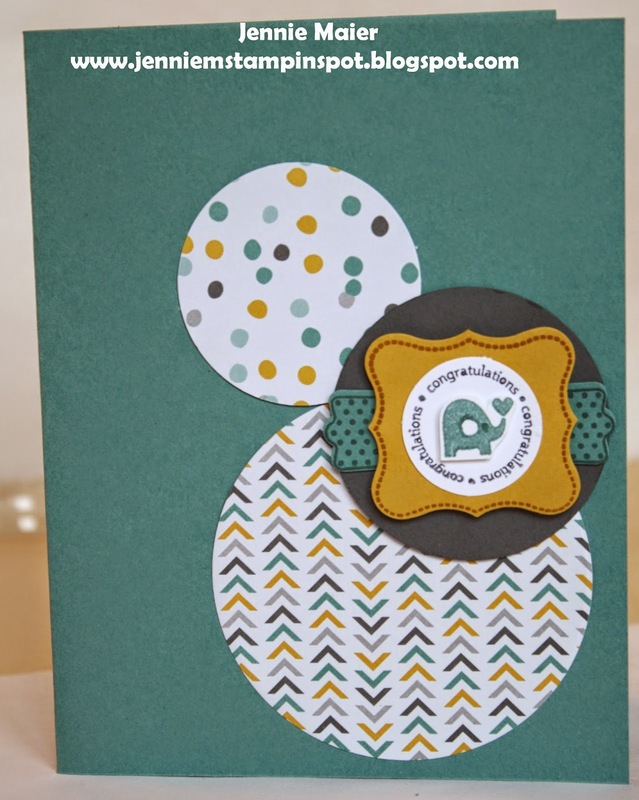 Perfect Pennants and Itty Bitty Banners are the stamp sets with some Sweet Taffy DSP. Yes, it's a Christmas card in August. I just had to use the hostess set, Good Greetings, that I earned. Hostesses can earn it too, for free-details coming later! I also used the stamp set A Round Array for the snowflake and some Flashback DSP. 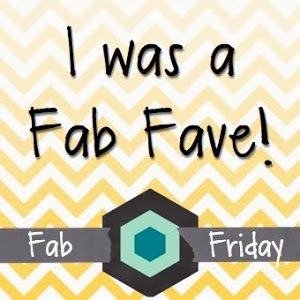 This baby card uses the FabFriday#47 here. A Fitting Occasion is the stamp set with some Moonlight DSP Stack. This card is for two challenges. First, the Splitcoast Sketch Challenge#499 here. 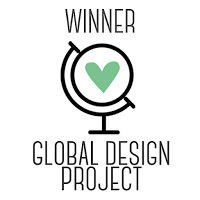 And second, the Create with Connie & Mary Challenge#314 here. 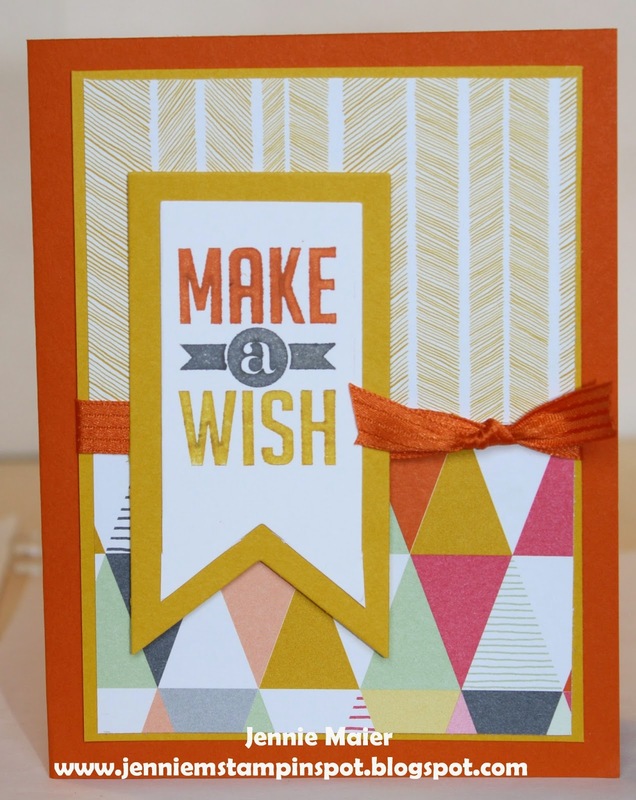 This one is a color challenge to use Tangelo Twist, Bermuda Bay and Basic Gray. 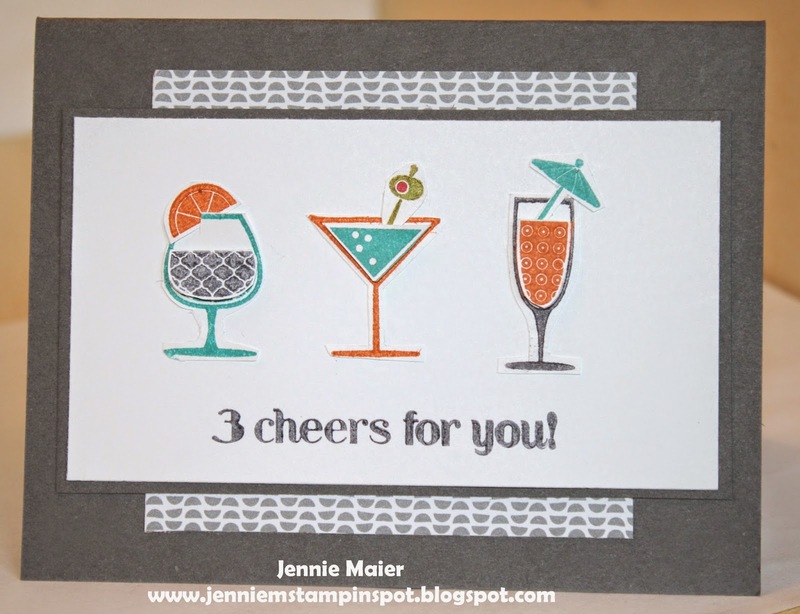 Happy Hour is the stamp set with some Confetti Celebration DSP.